Bernard Davies has helpfully provided us with the notes of the presentation he gave at the launch of his revised Manifesto in the Birmingham University on April 21st. These are well worth reading in their own right, stimulating you hopefully to engage with the Manifesto itself. Perhaps a touch tongue-in-cheek he begins with four negatives. I am not making any claim that this is the definitive statement on the meaning or definition of youth work. Firstly, I am very aware that youth work is and indeed should be a contested area. It is after all a human activity which, as such, will always be ‘unfinished’: will always attract interpretation and reinterpretation, not least as times and conditions change. So this is only my own personal best attempt to put into words what I see as its defining characteristics. Secondly, it is my best attempt to do that for today. As I say in the paper, this is another staging post on a long journey which for me goes back to 1980s at least. A number of earlier staging posts along the way have been marked by previous articles and talks, each registering some shifts in perspectives and conclusions. This has been particularly true in relation to political and policy contexts – a point I’ll illustrate later with a specific example. On the contrary, I take it as a given that young people of course need to have available to them great teachers at all levels, sensitive and responsive social workers and counsellors, knowledgeable and supportive careers advice and other skilled and committed specialists if they are to have the best chance of realising their full potential. Youth workers who think they are all young people’s saviours are either kidding themselves or – worse – seriously misleading young people. – a position, I have to admit, which in the past has sometimes got me into trouble with the youth work field. I of course recognise that values need to underpin all youth work practice. I also accept that some values are at least implicit in some of defining features I suggest – for example in its commitment to tipping balances of power in young people’s favour and in seeking to encourage young people to develop themselves beyond where they are starting when they first meet a youth worker. I also recognise that, at least implicit, there are some different value positions shaping a practice like youth work which starts from young people’s potential and work targeted largely on their deficits. However though what young people actually experience may not always live up to rhetoric, I would argue that most other practices today are as likely as youth work to make statements about, for example, young people’s rights to be respected as individuals, to get equal treatment regardless of their class, gender, ethnicity, ability, sexuality and so on, and to safe and non-exploitative relationships with adults. In other words, I am not convinced that youth work’s value base is sufficiently distinct from that of other youth practices to make it an adequate marker of what makes it a distinctive way of working with young people. This is why in the article I talk about ‘features’ and ‘characteristics’ of youth work as a way of concentrating our minds on how youth workers seek to act – on what they seek to do rather than on what they say they believe. – that is, for all youth workers, in order to get a licence to practice, having to fulfil some prior conditions or find their way past what some protective barriers. I don’t have time today to open up the (often complex and contradictory) debate on professionalism. In Fact, if I’m honest, I have to admit to being quite conflicted on this anyway, not least because I do believe (and strongly) that, for sustaining and improving the quality of what young people experience, it’s vital that youth work is embedded in a broader infra-structure of, as a minimum, on-going as well as ‘initial’ training, dedicated and skilled support and opportunities to reflect critically on practice. 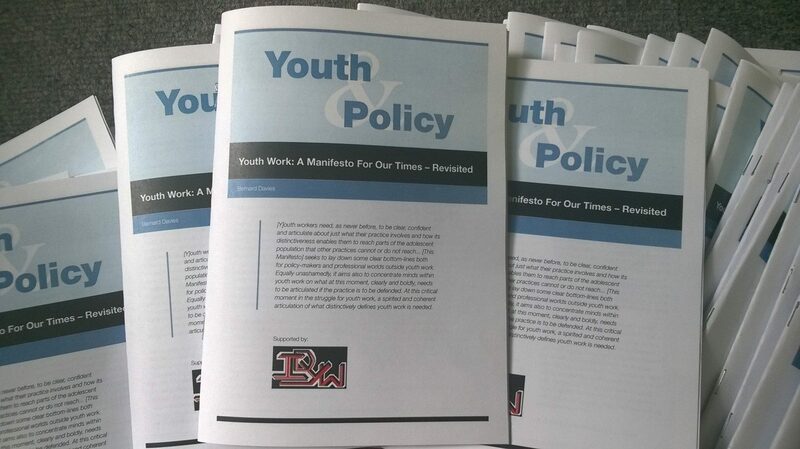 However, in writing the Manifesto it never occurred to me that I was trying to build a case for a profession of youth work – something which I only realised I hadn’t been doing when the Youth & Policy introduction to the original version pointed it out! As ever Bernard would welcome comments and criticisms. Next Developing Youth Work in Europe : Do we want to be part of it?